Please help me celebrate the release of my Dad's autobiography, "Bringing Aztlan to Mexican Chicago". 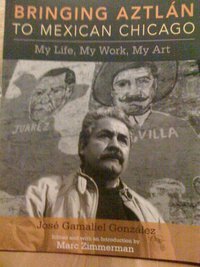 This book was edited by Prof. Marc Zimmerman and is a recollection of Jose's life and role in developing Mexican, Chicano, and Latino art as a fundamental dimension of Chicago and Pilsen. Jose is almost 80 years old now and this book is a real tribute to the power of community organizing, how art informs politics, and the beauty of family and friends. Light appetizers and drinks will be available with a small program starting at 7:00 p.m. We will also have some of my Dad's artwork available. Many thanks to Lenny Dominguez for offering his space for this party.